High insulation requirements and changes in construction practices have produced increased condensation in the roofspace. This has led to the introduction of mandatory requirements for ventilation in the roof. As clay tiles are largely specified for the aesthetic contribution they make, this initially posed a dilemma: early ventilation products were made of incompatible materials and were ugly and prominent. The Dreadnought Ventilation systems are discrete and integrate seamlessly with the tiles and do not disturb the design of the roof. 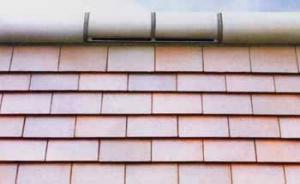 The ventilation products not only match the colour of the tiles, but also lie flush with the tiling or the ridge line. The image on the left shows 4 Tileline tile vents below the ridgeline. This offers a maintenance free, simple to install method of fixing clay half round ridges and at the same time forms a bird and insect-proof ventilation gap of 5mm all the way along the ridgeline. In warm pitched roofs where the insulation follows the rafters, it provides high level ventilation of 5000mm2 per lineal meter which would not be achieved with tile vents or ridge vents if there was no air circulation between the individual voids formed by the rafters or counter battens. Each tileline dry fix ridge pack is sufficient for 3 metres. 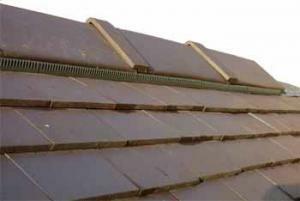 There are 2 plastic “rails” which are laid on the tops tiles on either side of the apex of the roof, the ridge tiles are laid into these with interlocking plastic fillers between each ridge tile. These are then screwed through a cleat and the plastic interlocking section into the ridge board. This system uses the rails from the Tileline dryfix ridge system together with capped angle ridges. The whole unit is then fixed into place with a screw and a washer. 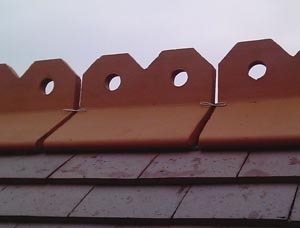 It provides a neat solution to mechanically fixing the ridge tiles while also providing ventiliation at the ridge. 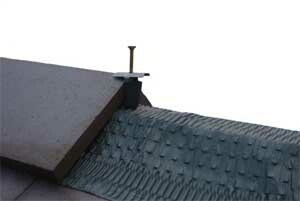 This system is suitable for all ridge and hip tiles except capped angle ridges, and is quick and easy to install. 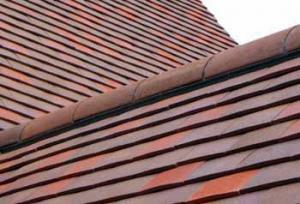 It is now mandatory, with the introduction of the new British Standard BS 5534, to mechanically fix all ridge tiles whether they are used on the ridge or or the hip line. The product comes in 6m boxes and consists of a corrugated grey coated aluminium roll which is laid out centrally on the ridge and temporarily fixed with double-sided adhesive tape. The ridge tiles are then laid over the top securing the roll in place leaving 10mm joints between each ridge. A cleat is then placed over the joint between the ridge tiles and screwed down into the ridge board. For ornamental ridges, a butterfly clip is used to attach on to the ridge tiles and provide a fixing that can be screwed into the roof timber. This is a discreet ventilator flush with the roof and designed to blend in to the rest of the roof. 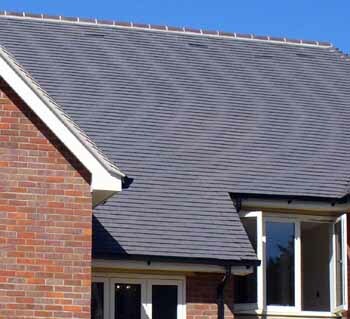 Sections of Dreadnought tiles are bonded to the leading edge of the tilevent in the same colour as the tiles on the rest of the roof to match in. It provides 7500mm2 of ventilation per tile vent and can be used with a pipe adaptor for joining to soil pipe or bathroom/kitchen extractor. Provides a ventilation area of 10,000mm2 per ridge vent and can used for ventilating bathroom and kitchen extracts or soil vent pipes in addition to providing roof space ventilation. Additional ventilation can be provided lower down the roof at the eaves.